A coroner in Northern Ireland has called for tramadol to be made a Class A drug. The prescription painkiller is currently a Class C drug. Joe McCrisksen made the comment at the inquest into the death of a west Belfast man, who died after taking a number of different prescription drugs, including tramadol, in April 2016. 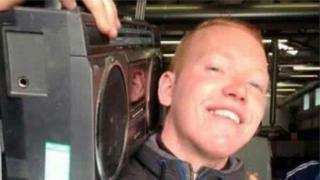 Aaron Strong, 18, also had phenazepam and diazepam in his system when he was taken to hospital. Mr McCrisken said there needs to be more education about the dangers of abusing prescription medication. "This view that prescription drugs are safe because doctors can prescribe them couldn't be further from the truth. "Possession of drugs without a prescription is a criminal offence. Tramadol should be a Class A drug, not a Class C drug. It wouldn't prevent its use, but it would send the right signal." Giving evidence, the acting State Pathologist Prof. Jack Crane expressed concerns about the use of tramadol. "Over the past number of years, there's been a significant rise in the number of death linked to tramadol. There's been more deaths from tramadol than any other drug at the present time," he told the court. When Mr Strong died, his family made the decision to donate his organs and his inquest heard that decision saved the lives of nine other people. His mother, Ann-Marie Strong, said she had received a letter from a 59-year-old man who received Aaron's heart. "He's a dad and a grandfather and he was given eight months to live, but because of the transplant he is now leading a healthy, normal life," she told the inquest. Speaking outside court Ms Strong urged other young people not to abuse prescription drugs. "I hope Aaron's death can save others. Kids are buying these drugs on the streets and somebody is going to die. "It's heart breaking for any mother to lose her child. "Aaron was very bubbly, he was a good kid. He didn't take drugs for years upon end, it was just one of them things, just a bad thing of drugs he took."